Senyati also boasts with an underground elephant hide or bunker for animal photography from ground level. 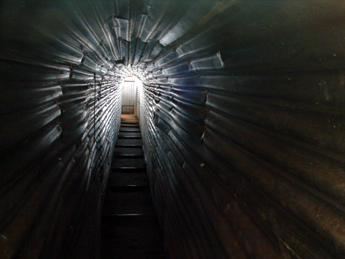 The bunker is located right in front of the lookout deck. 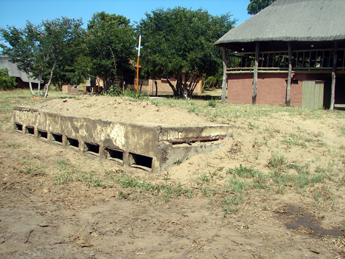 Hundreds of elephants at a time visit the waterhole during dry season and the bunker becomes an elephant “peep show”. Each afternoon, when Senyati pumps fresh water from a borehole to give the desperate animals some relief from a long journey through the bush, these giant animals put up a magnificent display for anyone who wishes to take stunning photos from ground level. The reinforced concrete tunnel is 18 metres long, leading to a wide lookout room with eight separate windows, each photographer with its own window. The average size adult can walk straight down the tunnel, which then leads to the lookout room. The bunker is for exclusive use of Senyati guests, 24/7 every day of the year. 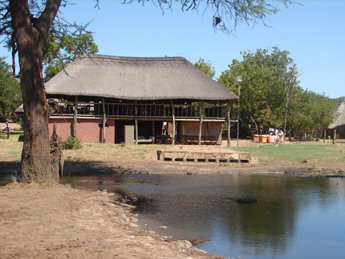 The waterhole is floodlit every night and one often sees nocturnal action along its edges after sunset. Hyena and jackal are the frequent nocturnal visitors; however, python, lion, leopard serval cat and honey badger also honour Senyati with their visits.